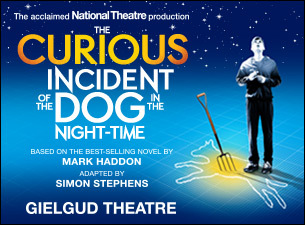 Curious Incident, adapted by Simon Stephens and directed by Marianne Elliott, was acclaimed by critics and audiences alike during its sell-out run at the National's Cottesloe Theatre and set a new record with its NT Live broadcast to worldwide cinemas, being seen by over 40,000 people in the UK alone. Luke Treadaway will recreate his ‘astonishing' (Time Out) performance as Christopher Boone, the fifteen year old maths genius with behavioural problems. Treadaway will be joined by Matthew Barker, Niamh Cusack, Sophie Duval, Rhiannon Harper-Rafferty, Nick Sidi and Howard Ward, who were also in the original cast. Further cast details will be announced in due course. He has an extraordinary brain, exceptional at maths while ill equipped to interpret everyday life. He has never ventured alone beyond the end of his road, he detests being touched and he distrusts strangers. But his detective work, forbidden by his father, takes him on a frightening journey that upturns his world.